I was driving through Destruction Bay, Yukon this afternoon when I saw an example of government keeping it’s promise to a local community. Many years ago, the Royal Canadian Mounted Police made a promise to the people of Destruction Bay to provide them with police protection against crime and traffice offenders. But just like the economy has hit all of us in the lower 48 hard…local, state and federal programs are endanger of being cut. 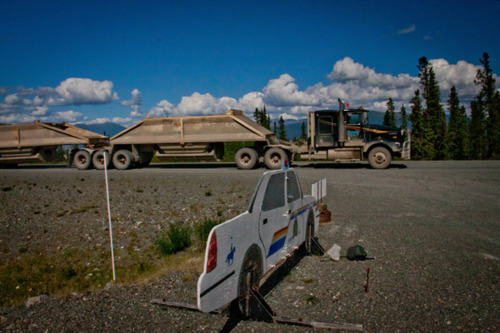 BUt the RCMP have kept the word and have maintained their presence in Destruction Bay. While I was in Gustavus, I stayed at the Homestead B & B owned by Sally and Tom McLaughlin. They have two rooms upstairs and a third room used as a sitting room. For breakfast the next morning, Sally fixed smoked salmon hash, two scrambled eggs laid by the chickens in her hen yard, fresh juice from a variety of local fruit she’d picked and homemade wholewheat toast. They also have bikes for guests to use to see the area. I rode around, hiked a two-mile trail not far from the house and then rode the bike about a mile and a half to the dock for my whale-watching cruise. When I got back, Sally had arranged for a taxi to take me back to the airport. 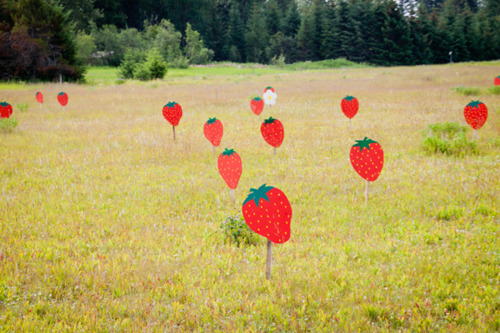 Apparently the bears here aren’t very bright because they seem to need to put up signs so the bears can find the strawberries. Tomorrow I’ll tell you about the ferry system and my trip to Sitka.